ROYAL Canadian Mounted Police are now riding motor cycles, 250 of these machines having been sold recently to the famous force. The last report, also shows nearly 200 motor cars in use. The operation and care of gasoline engines is now part of the course of training taken by every recruit joining the Royal Mounted. Mariners and radio operators are today included in the membership of the force. Fast transportation and faster communication are speeding up the work of the Mounties throughout the Dominion. The force can still claim the distinction of being mounted, but now the horses are being replaced by mechanical mounts. In ten years the number of horses in the force has dropped from 655 for a membership of 1,227 to 263 for a membership of 2,348. Why this change? Why is the horse being forced into the background? Crime moves fast today, and guardians of the law must not lag behind. To catch the present swift-traveling criminal, the horse is too slow. So police now use not only motor cycles and fast automobiles, but also speedboats, cruisers, outboard motors for canoes, skiffs, and other small craft, airplanes, and, naturally, the radio. New duties constitute another reason for the mechanization of the Mounted Police. The force now patrols the border waterways to catch smugglers of contraband and aliens. The customs preventive service was recently taken over by the police. Today Mounted Police keep tab on speeders in federal parks and on the provincial highways of Alberta, Saskatchewan, Manitoba, New Brunswick, Nova Scotia, and Prince Edward Island. To check up the traders, trappers, prospectors, and natives in the vast northern region, motor launches give quicker transportation in summer than the canoe. NOT long ago a constable on winter patrol in the Coronation Gulf district of the Arctic coast heard of a native murder. Within a few days, he had found the murderer. Within a few weeks, he had taken the prisoner to the post at Cambridge Bay and had used the radio station on a schooner frozen in there to give his report to Ottawa. Three days from his arrival at the post with his prisoner full instructions had been given the constable as to the disposal of the case. More than 2,200 miles of unsettled territory had been covered by radio, many months of weary travel had been eliminated by the use of fast communication. Compare this with the fact that in same region in 1912, five years of travelling back and forth between the Arctic and civilization were ‘ necessary in the capture and trial of another murderer. A CONSTABLE in a motor car on patrol duty along the New Brunswick coast saw a schooner off shore, which he took for a smuggler. That night the police patrol boat started out. With only two short flashes of light from the schooner to guide them, the police seized a motorboat laden with contraband. Leaving a constable in charge of the seized motor boat, the police patrol boat started out after a second motorboat which had a muffler and exhaust under water and could only be followed by listening. So well have the police adapted themselves to their new duties that before the operator of the silent boat knew what had happened the police craft bumped into him, a constable jumped aboard, ordered the boat stopped and found a second load of contraband concealed under fishing nets. At a northern Ontario trading post, a big Indian was causing a lot of trouble. He was thought to be slightly insane. Over forestry services’s radio a message was sent to Ottawa. Two days later a plane brought a mounted policeman to the post, and the Indian was flown to a mental hospital. Along the Arctic coast, the police still carry the mail in winter time. Once this meant untold hardship in fighting Arctic storms. It took many weeks before the east and west bound mail was exchanged between Aklavik and Bernard Harbour. Now the two men leave with their mail after making arrangements by radio, cutting down on the time on the trail. THE last annual report of the force shows that four men of the western Arctic division had gained their governmental short-wave radio licenses, which means they had demonstrated their ability to operate their stations by means of the dot and dash, and could repair the equipment in case of breakdown. One of those four men is the radio operator on the floating detachment of the â€¢ force, another factor in the task of speeding up police activity. The St. Roch is a permanent post of the organization, and its motors carry it along the Arctic coast on the duties of the force which include licensing fur trappers, seeing that the natives are not exploited, keeping up to date information for the Vital Statistics Act, licensing radio receivers, and collecting customs duty. A floating detachment was unthought of when the Mounties first hit the trail in 1874â€”on horseback. The airplane has also come into wide use. The force does not yet have its own planes and pilots, but even that day is not distant. For the range of professions embraced by members of the force has grown from cobblers, tailors, and carpenters to include the mechanical and engineering vocations, electrical workers and able and experienced seamen. The airplane played a prominent role in the western Arctic a few winters ago when Albert Johnson, a trapper, accused of lifting traps, defied the police and started a man hunt that lasted nearly two months. A plane, following his tracks, shortened the hunt and also carried supplies and men between Aklavik and the scene of action, and rushed those killed and wounded in the hunt to the northern metropolis. Today inspectors and superintendents of the force no longer rely exclusively on dog teams and water transportation for their numerous inspection trips. There are too many posts, spread too far apart to allow this slow method of travel. Airplanes are used to a large extent. There is another angle to this use of airplanes and motorboats by officers as well as men. It saves time and lessens hardships. In addition it is cheaper. It costs money to feed the dogs and the men and food runs high in the northern parts of the region policed by the Mounties. An airplane cuts days to hours and weeks to days. Economy in operating the force results. Flying Mounties keep an eye on the vessels along the coasts of the Atlantic and the Gulf of St. Lawrence. The air patrols in that region have proven so effective they are to be enlarged. One officer in the Maritime provinces has asked for an even more mechanized force to cope with the smugglers. 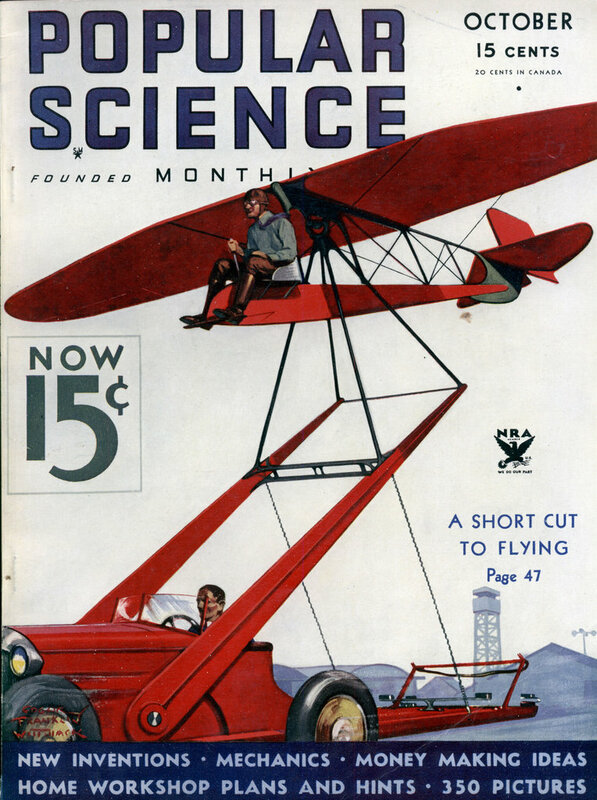 He would have motor cars and airplanes keep in close contact by use of radio. The force now has 101 motor boats and the constables no longer paddle canoes. Outboard motors speed them to their destinations, leave them fresher for their duties, and terrorize crooks. MOTOR boats are helping out where supply ships cannot go because of ice conditions. On several occasions posts that otherwise would have had to make a long haul overland for their annual supplies because of the inability of the steamer to make the isolated post, have had their supplies delivered by the police motor boat. Even the caribou have been partly saved from faster extinction by motor boats. Some of the posts in the Hudson Bay area, short of dog feed, were contemplating hunting for the fast dwindling herds of caribou to feed their dogs. Word of their intention reached the post at Chesterfield. There ample supplies of dog feed and dog biscuits were on hand. A motor boat brought these to the short-rationed posts. A few caribou were able to go on grazing. All this does not mean that the Royal Canadian Mounted Police have forsaken the horse. By no means. Every recruit is still required to be able to ride, to have some knowledge of the care and management of horses. Riding still has a place on the daily schedule of the training course. There is still stable duty to perform. There are still musical rides on occasion, still sports to play on horseback. Nor has the picturesque mounted member of the force entirely disappeared. Horses are now few in number, but where the vacationist goes, where tourists come in thousands, there the Mountie is still to be met riding a superb steed, and wearing the famous scarlet tunic, dark breeches with wide gold stripe, and high, spurred, glossy riding boots. MECHANICAL transports have even resulted in a change of uniforms. The wide brimmed stetson has gone by the board â€”for the motorized Mounties. A flat cap, as worn by the army, the municipal, and provincial police force, telegraph and bank messengers, has been adopted. It adds speed to the uniform, while it retains some of the color associated with the Mounties. It is blue with a gold band. Other changes have come about in the uniform. The motorized members now wear dark blue uniforms with gold stripe. Khaki has become a more worn colour by the members of the force, often with slacks instead of breeches and shining high boots, and minus the jingling spurs, the riding crop of the mounted divisions. The mechanization process, the demand for a better and faster moving force has also invaded another field of duty. Typewriting is now a requirement for a successful candidate. A good stenographer, capable of using and repairing a typewriter, comes out of the training class. Six months of typewriting instruction is now included in the course for recruits. That same demand for a better force has gone into acquiring better transport for those members who patrol the very far north, who in winter time cannot use motor boats, airplanes or other fast methods of transportation. Faster and sturdier dogs are being bred by the force at various points throughout Canada. Imported dogs, the famous Borzoi wolf hounds, are being bred with the husky dogs which are the beasts of burden in the northland. A sturdier, better coated and faster dog has resulted. Will the machine age in the Mounted Police mean the end of romance, glamor, and adventure? 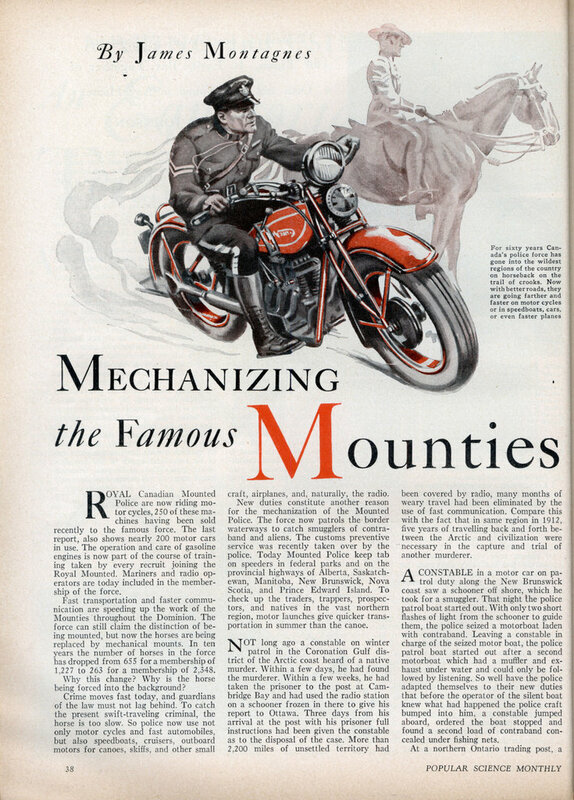 It is hardly likely that the mechanization will spoil the reputation built up in the sixty years that the force has been in existence, that the annual reports will be less replete with tales of courage, daring, and adventure, just because motorized mounts replace horses for most of Canada’s Mounties. The first time I vacationed in Canada, I was irrationally disappointed to find that Mounties dressed like any other highway patrol cop. I unconsciously expected them to wear their dress uniforms all the time. Most Americans do. They also expect that they’ll be riding horses. The RCMP handle all policing matters in smaller cities and rural areas outside of Ontario, Quebec, and Newfoundland & Labrador (which have their own provincial police forces). They also handle interprovincial crime, international crime, drug trafficking, smuggling, search & rescue, organized crime, railway crime, and official security. They do the work of your FBI, Secret Service, BATF, INS, state police forces, highway patrol, small-town police, and even handle some functions of your NSA, CIA, and Army. It may be hyperbole to say they do all these things more successfully, but they certainly do perform them more cheaply: Canadians pay about one-tenth per capita for the work the RCMP does compared to what Americans pay for their barrel of alphabet organizations. The first Mounties I saw WERE on horseback in ceremonial red. I’d been to Montreal several times and never saw RCMP there. About 5 years ago, I went to Ottawa, and the Mounties on duty at the Houses of Parliament are indeed mounted redcoats. By the way, in many towns and small cities the RCMP handle criminal complaints while the town or city’s by-law officers handle parking problems, animal control, etc. When I lived up in Yellowknife, one of my neighbours called the RCMP because there was a litter of fox kits behind our apartment building. The RCMP showed up, ascertained that indeed there was a litter of kits, and asked the complainant whether he wanted the foxes arrested or not.